Thank you for your interest in SMNF/SWCC. We are a community based organization whose mission is to help people better manage their lives. With each interaction with our clients, you have an opportunity to impact lives in a positive manner. Our team oriented approach affords –staff an opportunity to grow and develop while providing extraordinary customer service. Syracuse Model Neighborhood Facility (SMNF) was incorporated in 1973 as a neighborhood-based organization that provides services and activities designed to identify and reinforce the strengths of individuals, families and communities. We strongly believe that we cannot do this work alone; rather, we need the involvement of our neighbors and the community to help us live out our mission. Whatever way you come to volunteer with us, you have the ability to impact the lives of the people we serve in a positive way. 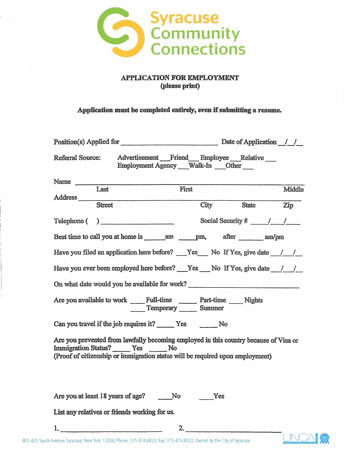 Please take a few minutes to complete our application and someone will contact you shortly. 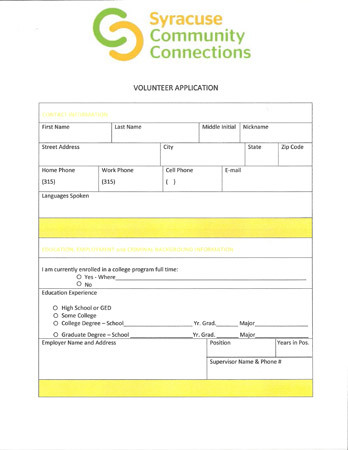 Please note: Volunteer positions involving working with our youth requires a Criminal Background Check including fingerprinting.